Flexible machining centre (FMS) with pallet transport, storage system and load/unload station. SOMETIMES workpieces are required to remain fixed in hydraulic jigs for extended periods for ongoing machining and processing. In these instances, it may be necessary for the whole hydraulic system to remain live so as to ensure the workpiece remains securely fixed in place by the hydraulic clamps. On other occasions, it may not be practicable, or best safety practice, to rely on the clamps being hydraulically actuated for extended periods of time. While hydraulic clamping provides the most powerful and precise method of applying power to the clamping system, the operator may prefer to have the security of a mechanical locking system to help provide failsafe security. Where this situation exists, a technology is available that provides a unique combination of hydraulic and mechanical clamping to retain clamping force. Enerpac's Collet-Lok technology employs a wedge, driven on by hydraulic pressure, to clamp workholding cylinder plungers in position and to maintain clamping force at 100 per cent after clamping pressure is released. This eliminates the risk of reduced clamping force due to leakage or pressure loss. The Collet-Lok technology is based on the principle of 'positive locking'. This principle involves locking the cylinder plunger after positioning, clamping or support, and retaining the clamping force on the workpiece. An important advantage of the Collet-Lok technology is that workpieces, awaiting machining, may be clamped onto the fixture well in advance of when they may be required. It is not necessary to maintain the clamping elements under pressure as these clamps, once locked, require no hydraulic pressure. This also provides a second important advantage - no complex hydraulic system is required to maintain the clamping, positioning and support cylinders under pressure. In the case of conventional hydraulic clamping, pressure is applied to the cylinders to position, clamp or support the workpiece. Constant hydraulic pressure must be supplied in order to maintain the clamping force. To maintain hydraulic pressure during the machining cycle an automatic make up system using pressure switches would need to be fitted to an electric pump. If the hydraulic connection cannot be maintained when the fixture goes into the machine then the pressure can only be maintained by a shut off valve and an accumulator. The accumulator will only make up for a slight drop in clamping pressure caused by a leak in the circuit. It is essential to maintain the hydraulic pressure and hence the clamping force in the machine during machining so that damage to the machine tool does not occur. To eliminate the risk of losing clamping force Enerpac has developed special 'clamping cylinders' with Collet-Lok technology. This technology is comparable to the securing of components with a bolted connection. The Collet-Lok cylinders are unique in that after the clamping cycle has been completed and the Collet-Lok driven on, the pressure can be removed and yet the clamp still maintains 100 per cent clamping force. In this way a workpiece may remain clamped on a fixture for many hours, days or even months without any reduction in clamping force. The Collet-Lok technology has been developed especially for flexible machining centres and systems (FMS). 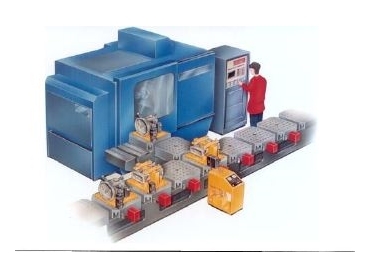 These machining centres can require adapted logistics to meet the rather complex fashion of loading. The internal features of the various Collet-Lok cylinders have many similarities with those of the normal positioning, swing clamping and support cylinders. Their operation is similar in that the clamping force required is built up by hydraulic pressure on the plunger. The Collet-Lok swing cylinder rotates and clamps as a standard swing cylinder. The Collet-Lok(r) cylinder has a built-in wedge system that can be pressurized by an extra hydraulic connection. When pressurized the wedge slides onto a mating chuck and clamps securely around the plunger. The plunger is locked in position by the chuck. Special grooves in the wedge system ensure optimum transmission of force. When the hydraulic pressure is removed, the clamping force will remain at 100%. In this way, mechanical locking is established. The Collet-Lok is released by applying pressure on the other side of the wedge system causing the wedge to be pushed back. All Collet-Lok swing and linear cylinders are double acting. Once locked with the recommended hydraulic pressure for the required time period they will maintain 100 per cent force. Swing cylinders can be fitted with a 'kick out' device designed to protect the product and the cylinder from damage. Damage could occur if the clamp arm accidentally makes contact with the workpiece during the swing movement. If contact occurs during rotation the "kick out" operates and stops further rotation but allows linear movement. This eliminates index mechanism damage. The cylinder plunger position can be reset by hand after investigation of the problem. Operation is straightforward, as the extra hydraulic supplies for the locking function are not always required. Sequence valves are generally used to operate the locking function so that only two hydraulic supply lines are required. When the Collet-Lok fixture pallet reaches the load / unload station it is connected to the hydraulic circuit either manually or by an automatic coupler. Loading and unloading of components can then be carried out, again either manually or automatically. The Collet-Lok system offers significant advantages for machining centres with several machines and pallets compared to conventional clamping systems. Enerpac supplies Collet-Lok swing clamping cylinders, linear cylinders and support cylinders in a variety of sizes from 11kN to 38kN. Mounting options of lower flange or threaded body with a variety of oil connections are available. *John Maudson is Australasian national production automation manager for Enerpac.